The intense, sweet, fruity aroma and flavor of this blend comes from a spritz of 100% pure lemon oil which is expressed from the peel of the fresh fruit. Lemon ginger tea yields a warm and comforting infusion with a lovely balance of rich ginger, bright lemon and floral coriander notes. 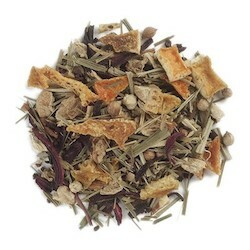 Ingredients: Organic roasted chicory root, ginger root, orange peel, lemongrass, lemon essential oil, hibiscus flowers, coriander seed, cinnamon chips. Directions: To enjoy, pour 6 oz. boiling water over one teaspoon of tea. Steep 3-5 minutes, strain and serve immediately. Safety Information: Hibiscus belongs to the same family as cocoa and cotton. Hibiscus may be intercropped with peanuts.